Center for Missed Connections Information Initiative is an edition of 100 booklet sets by artist Ingrid Burrington designed to help you better understand the loneliness and sexual tension that secretly govern city life through the lens of Missed Connections posts on Craigslist. The Citizen's Field Guide presents a complete data analysis of Missed Connections. We learn not only about the demographics, but also the particulars of where MC's take place, who's making them, and the "Grey Area" - the posts of ultimate lonliness. The second booklet, The Field Observation Workbook, encourages one to "Be Out and About!" and experience their own missed connections. Put to work as part of the CMC data collectors, participants are afforded a means to take down details about particular missed connections and have a perfect record should they decide to try to engage that special person online. 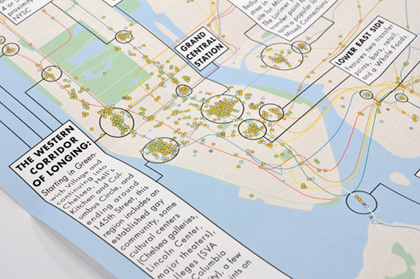 Materials: The set contains a Citizen's Field Guide, a Field Observation Workbook, a fold-out "Taxonomy of Missed Connections," as well as a full-color "Geographic Missed Connections Study: New York". Ingrid Burrington grew up in Northern California and currently lives in Baltimore, Maryland. She works in text, photography, performance, and print, and has produced projects both as a free agent and under the guise of semi-fictional think tanks, which have appeared throughout the mid-Atlantic and online. She received her BFA from the Maryland Institute College of Art in printmaking.